The Sample6 Detect HT system and the DETECT HT family of pathogen assays offer a comprehensive and easy-to use solution for your laboratory. Get more out of your laboratory space with fewer resources. Competitive systems force you to choose between an overnight test and economical solution. With the DETECT HT system you can have both. Our test is designed for overnight results, while priced competitively with most economical solutions available. The DETECT HT has a single transfer in the workflow: from the sponge bag to the assay tray. Competitive assays require multiple transfers of sample reagents. In addition to adding risk of error at each step, each of these additional transfers add up to cost you time and money. By switching to DETECT HT, you eliminate these unnecessary transfers. For every transfer you eliminate by using our assay instead, you can recover up to 5% of your efficiency for that operator. Reagents come prepared in single use, color coded cartridges to ensure the right reagents and volumes are used every time. The cartridges snap into place to easily set up and run in seconds. Eliminate reagent preparation time. The DETECT HT system can be used two ways depending on your laboratory’s needs, “Set-it-and-Forget-it” or “High Volume”. In “High Volume” mode, the operator will incubate the assay separately in any 35 degree incubator. This allows the operator to capitalize on the instruments injection capabilities to run up to 1,000 tests in a 3 hour period. “Set-it-and-Forget-it” mode will use the onboard incubator. 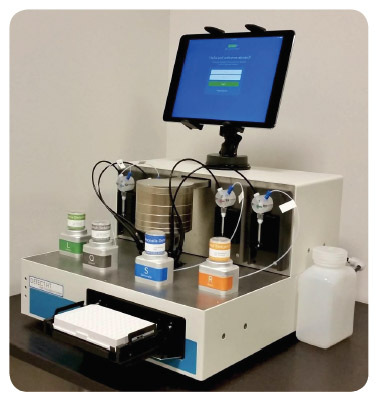 This will allow an operator to transfer up to 96 samples to an assay plate, click in reagents, and start the system. 2h 15m later, results are automatically available from any internet-connected computer. Competitive systems can monopolize valuable bench space with a large footprint, additional computers, dedicated heating/cooling blocks, and large reagent footprint. The entire DETECT HT instrument is 16″ x 16″ (1.8ft2), and consumables for 96 tests fit in a 6″ x 4″ x 2″ box. Our system is 5 times smaller than some leading competitive systems. Combined with our max throughput in “High Volume” mode, DETECT HT offers exceptional utilization of valuable benchtop space, up to 60 times more efficient than competitive systems.